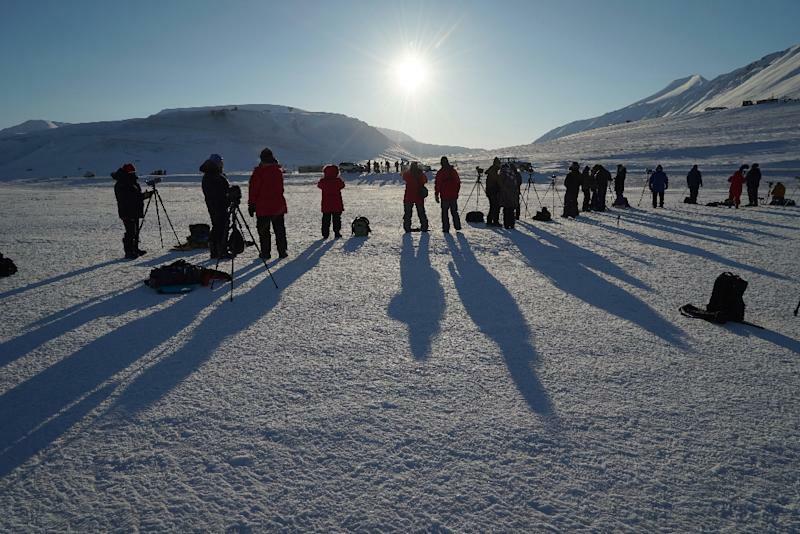 Longyearbyen (AFP) - Thousands of people flocked for a glimpse of the solar eclipse Friday, with the most intrepid enthusiasts swooning over spectacular sights in a frozen Arctic archipelago and aboard a plane above remote Nordic islands. A group of 50 die-hard Danish eclipse watchers paid 15,800 kroner each (2,121 euros, $2,261) to watch the event miles above the Faroe Islands from a Boeing 737 chartered by a science magazine. "It was so beautiful, I think it was the most beautiful solar eclipse I've ever seen," John Valentin Mikkelsen, a 63-year-old teacher from the Danish city of Aarhus told AFP. "We saw Baily's beads," he said, referring to a light show caused by the moon's rugged surface allowing sunlight to shine through in some places during a total eclipse. "It was beautiful, it was awesome," he added, with almost spiritual reverence. 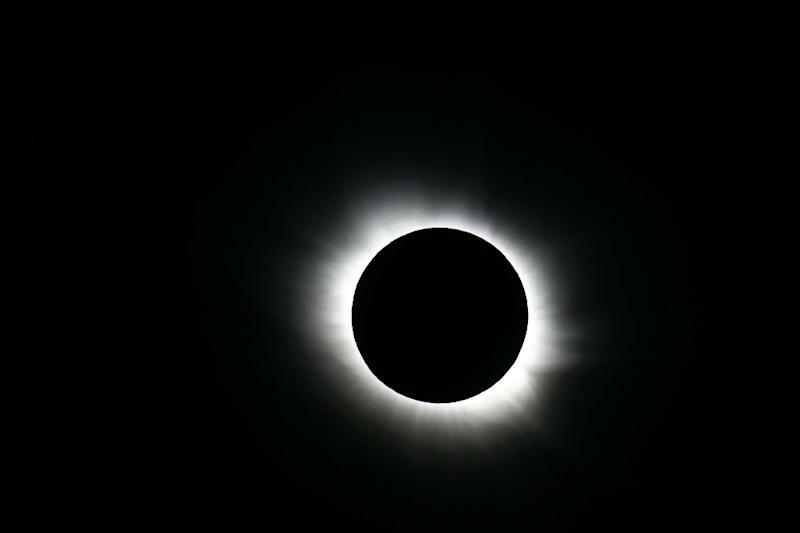 The Faroe Islands and Norway's Arctic Svalbard archipelago were the only places on Earth where the less than three-minute total eclipse was visible on Friday. "We had clouds... but it was still fantastic," said Ole J. Knudsen, an astrophysicist from Denmark's Aarhus University, who watched from hills high above the Faroes' capital Torshavn. "For 20 to 30 seconds the sky was covered and it became dark and there was a collective shock that you could hear from all the spectators," he said. More than 8,000 tourists had gathered in the Faroes, a Danish autonomous territory in the North Atlantic. The views were equally breathtaking in remote Svalbard's main town Longyearbyen, where the population of 2,000 had tripled ahead of the event. To a soundtrack of yelping sled dogs, Kathy Biersdorff, from Calgary, Canada, and her companions gleefully yelled the names of the eclipse phenomena into the bracing -20 Celsius (-4 Fahrenheit) morning air. "Crescent shadows! Diamond ring! Chromosphere! Moon's shadow!" they yelled. "Oh man... this is so amazing! I've never seen so many phenomena during an eclipse," she gushed. When the sun re-emerged from behind the dark side of the moon, a huge roar resounded from the crowd and some gazers began scrambling back inside nearby busses and a warming tent serving steaming cups of hot chocolate. Meanwhile, over Iceland, a group of eclipse chasers from around the world watched the event from a chartered plane. Michael Jackson, a Canadian watching his second total eclipse, described how the plane tried to chase the moon's shadow. "Because we were in a plane we were trying to keep up with the shadow... we couldn't keep up with it but still we were able to extend the totality (of the eclipse) from about 2.5 minutes to 3 minutes and 45 seconds," he explained. But elsewhere, those who headed outside to watch the partial eclipse on show had to contend with cloud cover. An eclipse of varying degrees was first visible across northern Africa, most of Europe, northwest Asia and then the Middle East. In the Swedish capital Stockholm, a watery crescent-shaped sun peered through overcast skies as temperatures dropped, prompting people in the city's business district to stop and take pictures with their smartphones. In many places observers were disappointed by the grey skies that marred the view. "We will be resuming our regularly scheduled broadcast of 'watching paint dry' right after the eclipse," tweeted Joe Costello from Britain. In London, where the moon covered approximately 84 percent of the sun, a lively crowd of around 500 people had gathered in Regent's Park to savour the moment. 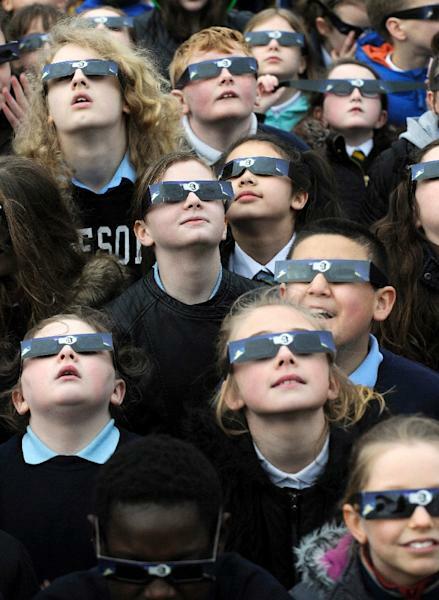 As with previous eclipses experts warned the public not to look directly at the sun due to the danger of eye damage, and a police officer handed out special glasses. A related celestial phenomenon also occurred on Friday, when the moon's alignment with the sun coincided with its perigee -- the point of closest proximity our planet. The gravitation pull created by those orbital forces are expected to create "super tides" on Saturday. Those will be most dramatic in Canada's Bay of Fundy, on the French Atlantic coast, in the English Channel and North Sea, though even levels the Mediterranean will reflect the high point in the 18-year lunar cycle. But on Friday, all interest was centred on the eclipse. In Svalbard, which is just emerging from four months of winter darkness, hotels had been fully-booked for years ahead of the event, the 10th solar eclipse of the 21st century. In the Arctic archipelago, where everything is extreme, visitors also had to contend with the threat of roaming polar bears. A Czech tourist who was lightly injured in a polar bear attack on Thursday served as a reminder of the danger posed by the animals, which have killed five people since 1971 in Svalbard. Total eclipses occur when the moon moves between Earth and the Sun, and the three bodies align precisely. As seen from Earth, the moon is just broad enough to cover the solar face, creating a breath-taking silver halo in an indigo sky pocked by daytime stars. The next total solar eclipse visible from Europe is not due until August 12, 2026.